Visual Studio tricks in video form | | FeedBurner move to Google, MyBrand and 404 errors hooray! This product is also available for WPF and for Silverlight. 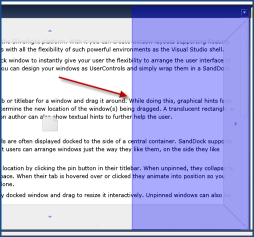 So if you need to add this type of dynamic window moving to your applications, you can check out the SandDock for Silverlight controls. What is great is that in looking at what else they provide, I was sent a demonstration link to a Ribbon interface, similar to that of Office 2007 that is becoming popular among Windows application these days. When I saw this demonstration I felt like I was looking at some weird hack or something…it was so strikingly similar to the Office interface and in Silverlight. I think organizations looking to have a line-of-business application with a familiar interface to what their users probably are already seeing is a good thing…it keeps a sense of familiarity in front of their face. That’s Silverlight in a familiar and functional user interface. Pretty cool. Their sample really made me think I was operating a full client application! The SandRibbon for Silverlight is currently undergoing beta use right now and they have a link on their site to request to try it out. It is so great to see this ecosystem of Silverlight controls emerge so quickly for us developers to take advantage of and create compelling user interfaces and line-of-business applications in a consistent and productive manner.